The NCCD is not well-organized yet. What I've done so far is come up with some main categories and sub-categories. There's a page for each main category and then the individual items are organized under sub-categories—for example, on the Organizations page, there are sub-categories like Organizations That Offer Worship Services, Associations, Movements, Publishers, Translators, etc. You can also see this basic structure in the footer. It's tricky to figure out what main categories and sub-categories to use and what things should be grouped together or listed in multiple places etc. I am by no means attached to the way I've got things currently organized and would welcome input (in the comments section below) about how to improve it. A directory is only useful if its information is up-to-date. I will do my best to keep things up-to-date but, as with many aspects of this project, it will only be done well with your help. Please let me know if you find any broken links in the NCCD (and you'll get bonus points if you can figure out what the right link is). I'm hoping that, eventually, a lot of people will be aware of the NCCD and it will be in their own interest to make sure that there's accurate and up-to-date information about their piece of New Church content in the NCCD. I want to go beyond just listing a bunch of links and contact information. There are a lot of really interesting New Church organizations, websites, projects, etc. out there but, if you don't know what makes a particular project interesting or don't know how to use a website, you might not stay on its website very long. It's the difference between just seeing an ad for something and having your friend send you a link to it with a little explanation of what they liked about it. This is where "Posts about..." comes in. When possible, in addition to listing just the website for a particular entry, I've also included a link to posts about that entry. 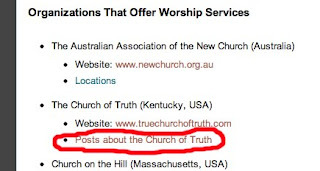 For example, I have an entry for the Church of Truth in Kentucky listed under Organizations > Organizations That Offer Worship Services. Frankly, their website (www.truechurchoftruth.com) isn't very good but I find what they're doing really exciting and I've written a couple of posts about it. And, if you click Posts about the Church of Truth you'll find those posts, including one which includes a link to an article about their leader. Another example is HeavenlyDoctrines.org. It's a great website but not particularly user-friendly. If you click on Posts about HeavenlyDoctrines.org you find 3 posts about it, including tips and tricks about how to use it, and a comparison of it and the other New Church search engines. Did I mention yet that I could use some help with this project? :) If the NCCD is going to come anywhere close to having well-organized, up-to-date, useful information about all things New Church, it will be because of lots of helpful people. The easiest way to help out is just to leave a comment on this post. Please let me know if something is missing, if a link is broken, if you have an idea about how the NCCD could be better organized, if you want to write a short informational post about an item in the NCCD. Sounds like a cool project, Malcolm. Currently my solution for gathering New Church/Swedenborgian information is to use google reader and google alerts. Google alerts posts on my reader feed any time "swedenborg" is mentioned anywhere on google's vast catalogue of internet content. If someone is blogging about Swedenborg, it will display on my alerts feed and then I can subscribe to that feed. Of course, its not limited to blogs, but also alerts me when Swedenborg is mentioned (or bashed as is usually the case) on forums, articles, commercial products, etc. Using this method, I have subscribed to more than 25 feeds from sources that post about Swedenborg or the New Church.